Hos Dorte: Halloween, A DT card for HM&FMC. Really cute card, thanks so much for joining us this month at Penny Black and More! 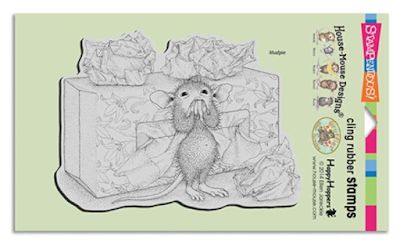 It's fun to see something besides a regular rectangular card - and I always enjoy seeing what these little mice get into! Thanks for playing along with us at the Simon Says Stamp Wednesday challenge! Takk for at du scrapper med oss hos Papirplaneten, DT Bente. What an adorable image & so beautifully colored too! Great job! Thanks for joining our weekly challenge at QKR Stampede! Such a cute design - beautifully coloured. 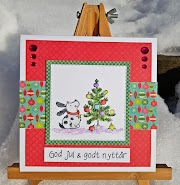 What a cutie, thank you for joining the challenge at Addicted To Stamps Challengeblog. 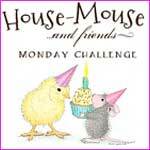 Hi Dorte, love the scalloped circle card and your sweet little baking mouse. Background is awesome. Herlig kort. Kjekt å sjå noko anna enn den vanlege forma på kort. Takk for at du deltar i Papirplaneten sin utfordring.